I'm sure you've all heard of this new style nail polish by Nails Inc, a spray paint can that allows you to spray on the nail polish and have a new manicure in 5 minutes, and the most fun part is that you can be messy! What enticed me to buy this was a YouTube video that showed a first impressions and a demo, so off I went to John Lewis to pick this up. This is something I can't fault, I absolutely love the spray can. It's a mini size that looks distinctive on the shelf, and is also blog worthy - who doesn't love that! The colour is indicated by the sticker that you can see on the lid of the paint can, however, once you have used this once you will see the colour around the nozzle of the spray as well, so there would be no need to worry if you lost the lid/the sticker came off. The point of this nail polish is the ease of application, and it certainly is easy. You simply apply a coat of the base and top coat, then spray on the nail polish (I'd recommend two coats), and then top it off with another coat of the base and top coat. They do recommend that you cap the edges to seal the nail polish in place. Once you have finished the application process, which takes around 5 minutes, you will no doubt have the colour all over your skin. 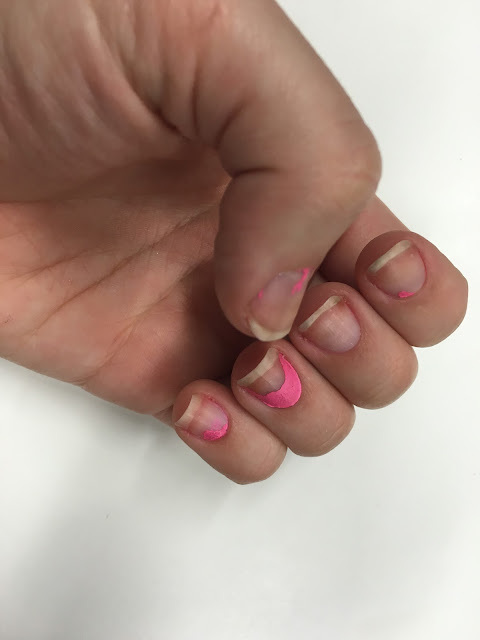 Lets be honest, we all do this with normal nail polish anyway. You will then need to go and put your hands in warm water with soap and gently rub this away, which is as simple as it sounds. Here's where the issues come into play. I applied this in the evening on a Saturday night, by Sunday morning the nail polish looked as below. Overall, my thoughts aren't high on this product. Although it doesn't take much effort to apply this nail polish, I would expect it to last longer than 24 hours. Have you tried this nail polish? What are your thoughts? If you're a beauty junkie like me, then you probably already follow Makeup Addiction cosmetics on Instagram. 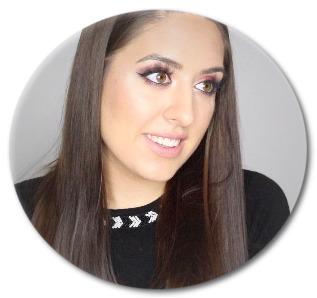 They are always posting pictures of their latest products, and more importantly, they repost beauties that have created gorgeous makeup looks using their products. A consistent product that is features on their page is the below palette, Flaming Love. This palette costs £25, and you can find it here. The packaging is straight forward and to the point, and this is never a bad thing in my books. When packaging gets too complicated it can distract from the product itself, and sometimes ruin it. This packaging feels like it is made out of a cardboard material, but is really sturdy. The lid magnetises shut, which is strong enough that you don't have to worry about travelling with it (although I would suggest you put it in a makeup bag just in case!). The shadows inside are a great size as well, larger than mac eyeshadows. It comes with a mirror on the lid, which is large enough for you to create any eyeshadow look that you want to. Makeup Addiction don't mess around when it comes to pigmentation. As you can see from the picture above, each shimmer shadow was at full pigmentation with one swipe, whilst the mattes took two swipes with the finger. When I applied the shadows to my lid with a brush, the matte shadows didn't lack at all with pigmentation, if anything I'd say you need a light hand when it comes to actually applying them on your eyes. Briefly mentioned this above, but I would definitely recommend applying the matte shadows with a brush, somehow they bring the pigmentation out a lot stronger than fingers do. However, if you are going for the shimmery eyeshadows then the warmth of your fingers really brings out the creaminess of these shades. Overall, I am completely obsessed with this palette and can't believe I didn't purchase it myself before Christmas! Have you tried this palette? I'd love to hear your thoughts! At the top of my Christmas list last (last?!?!) year was a hair dryer, I had put lots of research into the hair dryer that I wanted. As we all do, I wanted my hair to dry fast, the hair dryer to be lightweight, but also powerful and have temperature options. This is where I have found the perfect match! I asked the boyf to get me the BaByliss 3Q hair dryer, which at it's normal price comes in a hefty £120, however this was on offer at £89.99 at the time. Oh does this baby have power! You have 2 speed settings, a low and a high which is the lowest button on the hairdryer. The lowest speed is perfect for giving yourself a 'professional' blow dry, and the high speed is perfect for speed drying your hair. One thing I love in a hairdryer is how hot it gets. I love to be able to change the temperature, but for those moments when you just get out of the shower and want to dry your body hair this is perfect! There are 3 heat settings on the middle switch, which is low heat, medium heat and hot. There is also a cold button which you can press to give your hair a blast of cool air at the end to lock in shine. Trust me, this works. This is the only time any girl is comfortable talking about weight I think! BaByliss have made this hairdryer the perfect weight, not too light so it doesn't blow out of your hands from the power of the hairdryer, but not too heavy that your arm is aching after 30 seconds of drying your hair. I feel like I only need to say 'look at it' in this section, its bloomin' beautiful! I have had so many people comment on how shiny my hair is after using this hairdryer, which automatically makes me happy to receive this as a gift! Have you tried this hairdryer, or do you have one you love? Let me know in the comments below. I'm a huge fan of straighteners, I've always been the girl to wear her hair straight over curled. I'm not sure why, perhaps it's laziness, who knows (it's laziness). However, since 2004 when I was bought the first pair of pink ghd straighteners I fell in love, and then to have this gorgeous Arctic Gold ghd straightener sent to me for review, I couldn't quite believe it. This is ghd's latest collection, which comes with two curling tongs, two wands and a hairdryer (sold separately). Whilst I can't speak for the other items, I can give you a review of the straightener. As you can see above, the straighteners come in a gorgeous white box with a gold design that has a festive feel to it. There is a clear image on the side of the box as to what it contains. The straighteners themselves are in a gorgeous ice gold colour, with white and gold accents which makes them feel much more luxurious. They also have a swivel cord, as most ghd's do, which means you can twist and turn the straightener and the wire won't tangle... result! ghd's work. We all know that by now, otherwise they wouldn't be so prevalent in the hair straightening world. I do feel a difference between these and my previous straighteners though, the arctic gold collection glides through my hair so easily making my hair straight in a matter of 5 minutes. Here it is appropriate for me to tell you that I don't have curly or unruly hair, I have naturally pretty straight hair with the odd kink here or there. However, I do see them smoothing out all hair types without any fuss. The one thing that I can definitely vouch for with ghd's is their durability. Remember that pink pair I spoke about earlier, yup I've still got them and they're going strong! Admittedly, I don't use mine everyday, in fact once a week might be pushing it. But the repetitive use of them over 11 years hasn't seen them faulted in any way whatsoever. Overall, I don't think I could ever look to another brand to recommend other than ghd's. They get the job done, and they get it done the first time. I know what you're thinking, this sounds sponsored or that I only like them as they were sent to me, but none of this is true. I just wanted to share a genuine review of these with you (they didn't even ask me to write this! ).